The most common framerate debate is whether or not 30 FPS is acceptable, or to what degree 60 FPS beats 30 FPS. These numbers originate from the “console vs. PC” debate. For stability reasons, many console games are capped at 30 FPS. Consistently rendering modern games at framerates above 30 FPS can be difficult on hardware, and consoles simply aren’t equipped with the most powerful hardware available. On the other hand, any modern computer display will come with at least a 60Hz refresh rate. Nearly every PC gamer has the ability to see at least 60 FPS when gaming (by tweaking and lowering settings if needed), and they can see even more if their monitor supports refresh rates of 120 or 144Hz. Ultimately, the framerate you personally find acceptable will vary depending on the type of game you’re playing. To tolerate playing a twitchy first-person-shooter such as Counter-Strike, you’ll generally require a higher framerate compared to what’s necessary for a methodical strategy game such as Civilization. Looking at the animated .gif above, FPS becomes more noticeable as the speed of the image increases. We’ll let you decide which framerate you’d rather have while playing a fast-paced game. The only framerate that really matters is the one you find acceptable, so how do you test your eyes to check? Thankfully, there are tons of resources online to help you figure that out by comparing framerates — especially 30 vs. 60 FPS. One of our favorites is 30vs60.com, which shows gameplay from popular games side-by-side at the two different framerates. The Battlefield 4 Running comparison is one of the best. Focus on the 30 FPS gameplay on the left for 1-3 cycles, and then look over at the 60 FPS gameplay. You are almost guaranteed to notice a significant improvement to the smoothness. 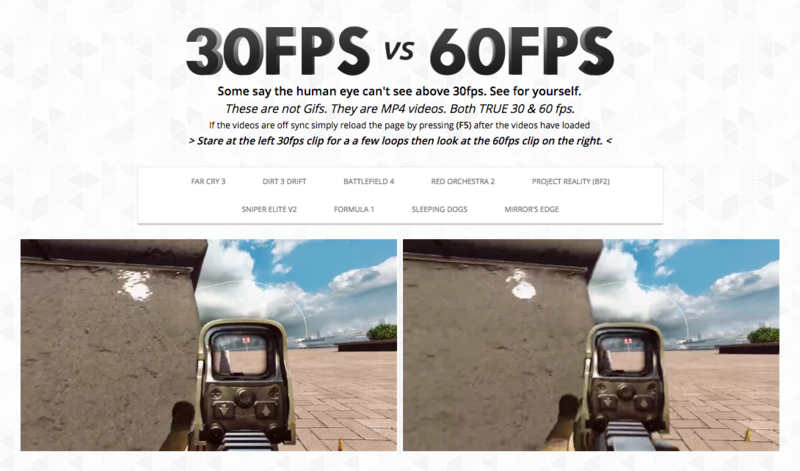 If you really want to check your eyes, you can actually take a test over at Frame Rate Matters, a website that displays side-by-side gameplay at 30 and 60 FPS, requiring the user to see if they can tell the difference. How many FPS can the human eye detect? The number of FPS detectable by humans ranges considerably from one person to another, and people can be trained to more quickly perceive visual information. Eyes process a continual stream of light-based visuals and are not limited to a certain “eyeball framerate,” but it can be helpful to consider how quickly the brain perceives information received from the eyes. A recent MIT study found that participants could identify images seen for as briefly as 13 milliseconds. That equates to 77 frames per second — not bad! At an even greater extreme, an old U.S. Air Force study reportedly showed that fighter pilots could identify planes seen for as little as 1/220th of a second, according to AMO. In other words, those pilots would theoretically be able to perceive up to 220 FPS. Really, the amount of FPS detected by the eye (or, more accurately, the brain) will vary quite a bit depending on who you are and how quickly your brain processes visual information. Making a blanket statement that “the human eye can only see X frames per second” is just not accurate. A powerful gaming PC will have the ability to render games at more than 60 FPS, but they’re often held back by the most common refresh rate for monitors, which is 60Hz. Thankfully, more and more manufacturers are releasing monitors with refresh rates of 120, 144, and even 240Hz. To see some of our favorite recommendations for high-framerate monitors, check out the gaming screens section of our peripherals guide.